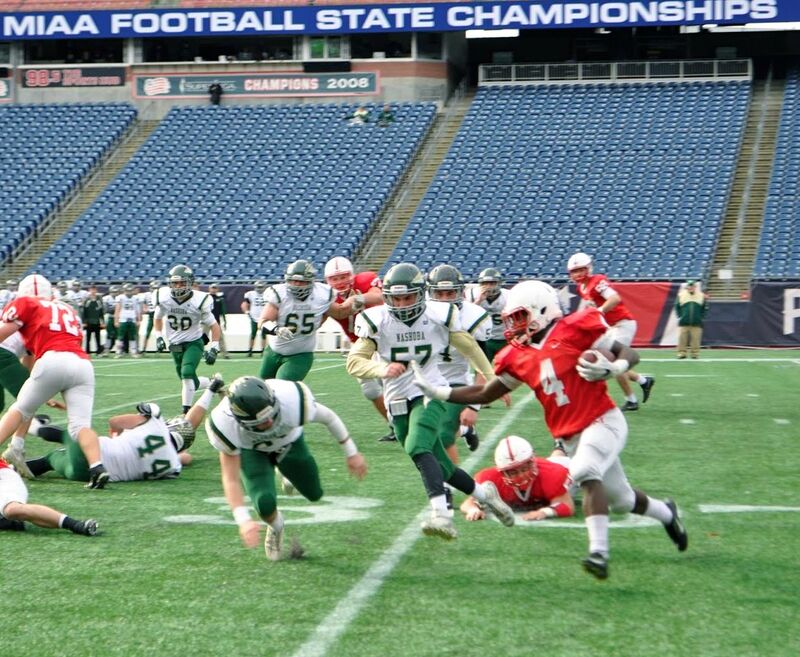 FOXBOROUGH - The Melrose Red Raiders (13-0) came to Gillette Stadium for the MIAA Division 4 Super Bowl with 24 seniors, all of whom hoped to avenge back-to-back Super Bowl losses at Gillette in 2014 and 2015 to the Dartmouth Indians. Avenge they did, courtesy of a 21-0 shutout victory over the Nashoba Chieftains (10-2), in a game where the Red Raiders ran all over their opponent, and delivered their longtime head coach Tim Morris a Super Bowl trophy. After the Chieftains defense forced a punt on the Red Raiders first offensive series of the game, its offense took over and worked a methodical drive into the red zone. Then, disaster struck for Nashoba. Junior quarterback Sam Bolinksy kept the ball on a 3rd and 1 sneak and stayed down on the field with an apparent lower leg injury. While Bolinsky was able to return for the Chieftains first offensive drive in the second quarter he returned to the bench shortly after. The Red Raiders' offense finally got their stud RB Isaac Seide the ball early and often in the second quarter, including a 37-yard scamper and a one-yard slam for the only touchdown scored by either team in the first half. Once the second half started it was all Seide all the time for the Red Raiders who continually pounded their star running back and didn’t do much of anything outside of that offensively. In fact, the Red Raiders only attempted two passes in the game and neither were completed. While the Red Raiders offense turned on the jets in the second half, credit its defense for continually making timely offensive plays, creating a turnover courtesy of a Chris Cusolito interception, and forcing Chieftain punts time and again. 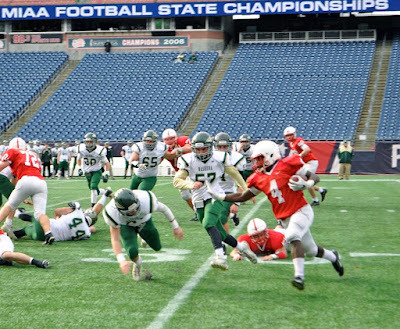 Though Cusolito made the biggest play of the game defensively for the Red Raiders, it took a team effort to stop what had been a potent Nashoba offensive attack. His head coach recognized the clutch play of his sophomore defensive back during the playoff run. Cusolito, like many teammates, touted the greatness of Isaac Seide after the Red Raiders’ shutout win. On completing an undefeated season and capping it with a Super Bowl victory at Gillette Stadium, Cusolito described the emotions of his team quite succinctly.